If you read last week’s NHSM16 blog, Dark Nights, you will know that burglaries spike by a massive 20% when the clocks go back and you’re more likely to be burgled on Bonfire Night than any other night of the year. While last week’s blog dealt with the issue of dark nights, we’re looking specifically at Halloween in this final week of National Home Security Month. With Halloween comes trick or treating and this can offer burglars a great cover for approaching properties without raising suspicion. There is also the risk of damage to property from the less responsible ‘tricksters’ and those participating in mischief night at this time of year. Here’s how to protect your home and some tips for responsible trick or treating as well. Halloween can be a bit of fun, even if you don’t have young children. 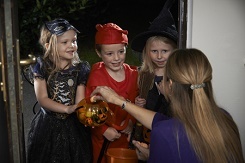 You can join in by having some treats in for the children and they will really appreciate it if you make a little by of effort with some decorations or good supplies of sweets – maybe reward the ones with the best costumes with the best goodies?! 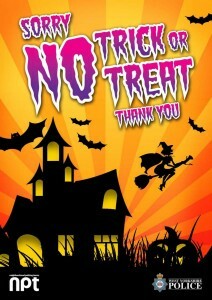 Halloween should be a fun evening for everyone so following these tips will help it remain that way. Don’t give a burglar the opportunity to make it a fun evening for them (and a terrible one for you). This blog has been written as part of NHSM16 and is the final themed blog of the campaign. You can see previous posts on burglar statistics, protecting the entry points to your home, smart home security and protecting your home now the clocks have gone back and catch up with all content linked to the National Home Security Month campaign here.